Film festivals are full of interesting coincidences, and here’s one: The Seattle International Film Festival this year features three dramas about middle-aged married women who become attracted to men who are not their husbands, featuring wise, subtle and devastating star turns by three of the finest actresses working today: “I Am Love,” with Tilda Swinton (one more SIFF screening Friday in Everett, then opening for a regular run in late June); “Leaving,” with Kristin Scott Thomas (at SIFF Friday, Sunday, and June 12; not returning as far as I know); and “Cairo Time,” with Patricia Clarkson (at SIFF Sunday and Monday; in theaters in late August). Though the stories are similar, the settings take us around the world: Swinton, speaking Italian, plays the wife of a Milan businessman; Scott Thomas, speaking French, is an upper-class mother and wife in the south of France; Clarkson plays an American (or perhaps Canadian?) in Egypt, awaiting the arrival of her diplomat husband. All meet a man who is younger, of different ethnicity, and/or different class; all are captivated. Swinton and Scott Thomas’s affairs are tempestuous: “I Am Love” plays like swirling Italian opera; “Leaving” like Madame Bovary in a downward spiral. Clarkson’s, the least consummated of the three, is quieter, told in longing, wistful glances captured as doors close. All of these films are well worth seeing, most notably for these performances (though “I Am Love,” the most imaginative of the three, has a rare visual beauty that some may find over-the-top and others — like me — will find thrilling). And it’s worth paying brief tribute to Swinton, Scott Thomas and Clarkson, who don’t get the attention a Meryl Streep does (and that’s no slur on Streep; she’s astonishing and deserves every accolade she gets), but who have quietly amassed three strings of remarkable roles, like a triple-strand pearl necklace. Should you wish, some day, to have a Great Actresses Film Festival (which I might just have to do at my house sometime soon), consider Swinton in “Orlando,” “The Deep End,” and “Stephanie Daley”; Scott Thomas in “The English Patient,” “Gosford Park” and “Tell No One”; and Clarkson in “Pieces of April,” “The Dying Gaul” and “Married Life” — just to name three for each. Though none, alas, are visiting SIFF, you can see them all on the big screen this weekend — a rare pleasure. 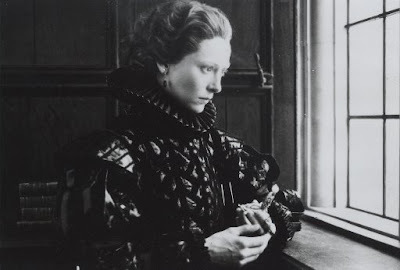 Swinton in the great 1993 Sally Potter film “Orlando,” in which she plays a character who lives four hundred years and changes from man to woman. Sounds odd? It is (based on Virginia Woolf’s fanciful novel), but it’s a joy to watch.